Every so often, you just have to take another look. And when you do, or at least when The Legal Genealogist does, it can sure point out the holes in your research. Case in point: Anna Adelheid (Wöltjen) Lahrs. Anna is bone of my bone, blood of my blood. She is my fourth great grandmother, from the line that begins with my paternal grandmother. So this is in my German line. And what I know about Anna is pitiful. That death record –– recorded in the civil registration records of the Bremen city clerk’s office (in German, the Standesamt) — is a gem for that time. 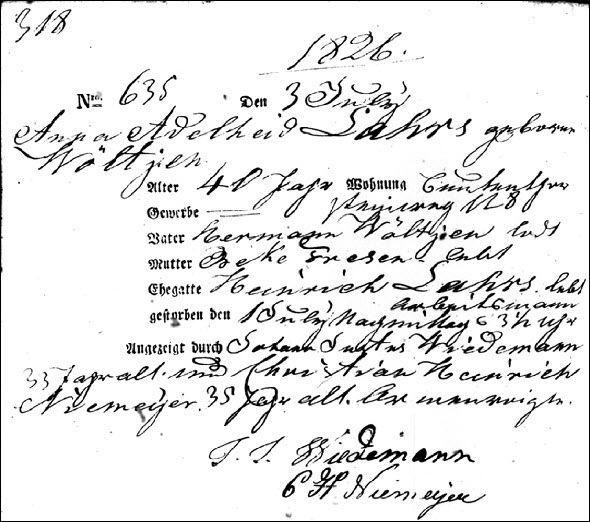 From her daughter Beta’s 1833 marriage record, I know that Beta was 23 when she married Gerhard Nuckel in Bremen on 9 August 1833.6 And the funerary records of the City of Bremen in 1878 list Beta as 68 years old when she died.7 That puts her birth in 1810. And that means that Anna was about 24 years old when Beta was born. Born 1786. Giving birth to a child around age 24 in 1810. Dead in 1826. I don’t expect to be able to find the depth of information I would really like to have about Anna: what she looked like, what her voice sounded like, whether she was merry or dour, the shape of her hands, her favorite color. Her time was long ago and — particularly as a woman at that time — the records she would have left will be sparse indeed. But there is more that can be found — much more that I haven’t done yet. I need to look at the Bremen city records to see what other children Anna may have had, not just the one from whom I descend. And I need to check those records to see if I can find any siblings Anna may have had. I need to look at the church records from all the churches that all the family members attended. Did Anna ever stand as godparent to children in her neighborhood, in her family, in her church community? Did she ever stand as witness to a marriage? I need to look more deeply at the civil registration records for her time. Did Anna herself ever report a birth or a death there in Bremen where she lived? I need to look at whatever I can find about the neighborhood itself where Anna lived and died: what was Buntenthorsteinweg like in the first decades of the 19th century? What did people there do for a living? What was the socioeconomic condition of that area? Was Anna well-off or poor or just average compared to her neighbors? I need to look at Anna’s FAN club — the friends, associates, and neighbors with whom she and her family were associated.11 Who, for example, were the men who reported Anna’s death to the city authorities? One of them, Johann Justus Wiedemenn, also reported her husband’s death just a few months later.12 What was his relationship to the family? These are just some of the things that I can still do to research the life of this fourth great grandmother. I owe her at least that much to try to find and to tell her story. Because, after all, she is bone of my bone, blood of my blood. And if I don’t find and tell her story… who will? You are so right to research beyond the direct-path information to find your ancestor. It’s refreshing to see a pro like you step back when she realizes the info she has can’t take her current any further in her research, then sees her next steps are back to basics but often overlooked FAN research. This helped me find the birth family of my great-grandfather and many other ancestors. I wish you success in your continued research to find more about 4th great grandma Anna. It’s not that long ago that she lived and her story deserves to be told.